One of the questions I get asked most often when people find out I’m a yoga teacher is, “How do I become more flexible?” Being more flexible can help you feel more comfortable in your everyday life, allowing you to sit and do other activities more comfortably. Stretching your muscles to increase flexibility just feels good, too. 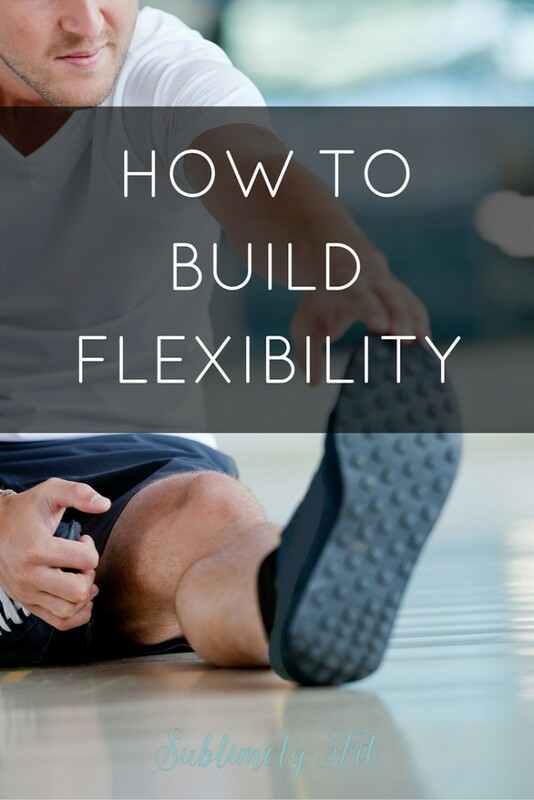 If you’ve been trying to build flexibility but feel like you’re not getting anywhere, this post is for you. You won’t become Gumby overnight, but if you do these three things, you’ll definitely build flexibility. If you’re more of a video person, be sure to scroll down to the bottom—there’s a video waiting for you there. One thing I tell my clients all the time, especially clients who tend to have tighter muscles to begin with, like runners and desk sitters, is that they need to focus on finding the right amount of stretch. Pushing harder into a stretch is almost always counter-productive. Your muscles start to lock up when you stretch too far, as your body naturally tries to protect itself from overstretching and over-stressing the muscles. Do you want to be more flexible? Do these 3 things! It’s very important to find a place in the stretch where you feel a gentle opening or pull through the muscle. Make sure the muscle is warmed up by doing some gentle movement for a few minutes, maybe go on a short walk or just move around. Then, find a comfortable stretch in the muscle you want to lengthen. You should feel like you can sit in that stretch for a while. When you find that sweet spot, your body will start to relax as you breathe deeply and focus on releasing the muscle that you’re stretching. That’s when you’ll start to see improvements in your flexibility. Being consistent with your stretching is also huge. If you just stretch once a week, or even less, you’ll make small improvements on the day you stretch and shortly after that, but your muscles will start to tighten up pretty quickly, especially if you’re working out or using them regularly. Stretching doesn’t have to take forever, so if you’re really serious about building flexibility in a certain area of your body, set aside five to 10 minutes to stretch at least every other day, if not daily. Stretching can easily be done while you’re watching TV or checking social media on your phone, so if you’re really crunched for time, figure out how you can multitask and stretch at the same time. You probably won’t release as much as you would if you were fully focused on the stretching, breathing and mentally focusing on lengthening and releasing your muscles, but it’s still better than not stretching at all. You can stretch all you want, but if your muscles have adhesions that are preventing your muscle fibers from being able to fully move, you won’t get very far. Adhesions in the muscles naturally form as your muscles repair themselves and get stronger after you work them, whether it’s at the gym or just doing work in your daily life. Self-massage helps to break up those adhesions, not only helping you feel better, but also allowing you to find greater flexibility. Use a foam roller or other self-massage tool to massage out the muscles you plan to stretch, then stretch them gently when you’re done. You’ll see a big difference. Self massage is definitely a great way to build in flexibility, and one that few people think of! These are great! Consistency is key. I always love a good stretch but don’t always incorporate them enough. Thanks for this post! Adding in more yoga and improving my flexible are part of my current running goals. Breaking it down into smaller ‘to-dos’ is really helpful!